My Davao Jobs is a new site that allows employers and jobseekers in Davao City to connect. 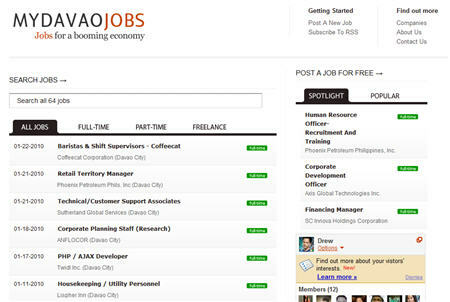 For employers, posting jobs is easy and free. All they need to do is use the submit form, fill in the job details and send. I noticed some nice activity slowly trickling in, which is a sign that people are finding it useful. For jobseekers, submitting an application could be done directly on the job page. My Davao Jobs, unlike any other site catering to the same locale, allows jobseekers to attach their resumes. If you’re an employer or jobseeker in Davao City, check out My Davao Jobs! Thanks for posting this…I’ll share this with my friends in Davao. Great site! I saw your site when I was looking for a job opening in Davao. That was the time when I was workng in Cebu still and want to be relocated in my favorite city of Davao. Im a graduate as well of davao and I want to really work in that city. im always viewing the site for job openings since not all job sites are complete. I appreciate your site that really helps unemployment rate in the city and also jobseekers and can have a one site to view.